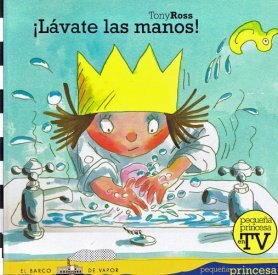 Spanish-language edition of Wash your hands! The Little Princess loves getting her hands dirty, whether its playing with the animals, using the potty or sneezing. Trouble is...she hates washing them. But then she hears about the nasties and the dirties and all the other horrible things that lurk and make you ill and has a change of heart! This book will delight all youngsters as well as teaching them an important lesson about good hygiene. The simple sentences will help to develop early Spanish-language skills. Lávate las manos is written entirely in Spanish and so it would be necessary for the parent or child to have a reasonable knowledge of Spanish. There is no translation or pronunciation guide included because this is aimed at native Spanish speakers.